Sunshine and clouds mixed. High 81F. Winds NNW at 5 to 10 mph..
John Noor, chairman of the Asheville Sustainability Advisory Committee on Energy and the Environment Commission, left, receives an award from Sierra Club member Ken Brame for his efforts as a government volunteer. Asheville City Councilwoman Julie Mayfield is honored as the green elected official of the year by Sierra Club of Western North Carolina. Brad Rouse of Energy Savers Network, right, accepts the Environmental Organization of the Year award along with members Yulia Shaffer and Alice Wyndham. Leah Cooper of Sierra Nevada Brewing Company, left, accepts the Green Business of the Year award from Sierra Club member Maryanne Rackoff. Will Harlan, editor-in-chief of Blue Ridge Outdoors, center, was presented the Conservation Advocate of the Year award by Sierra Club members J.D. Diefenbach, left, and David Reid, right. Judy Mattox, executive committee chairman of Sierra Club of Western North Carolina, left, presents Carlton Burke with an award for his work as a naturalist, educator and wildlife rehabilitator. Judy Mattox, executive committee chairman of Sierra Club of Western North Carolina, receives the Political Volunteer of the Year award for organizing the effort to support pro-environmental candidates and help them be successful in the November elections. Volunteers, a local business, an Asheville city council member, a naturalist and a state National Guard officer were among recipients of environmental recognition awards at the Sierra Club of Western North Carolina holiday party Dec. 6. 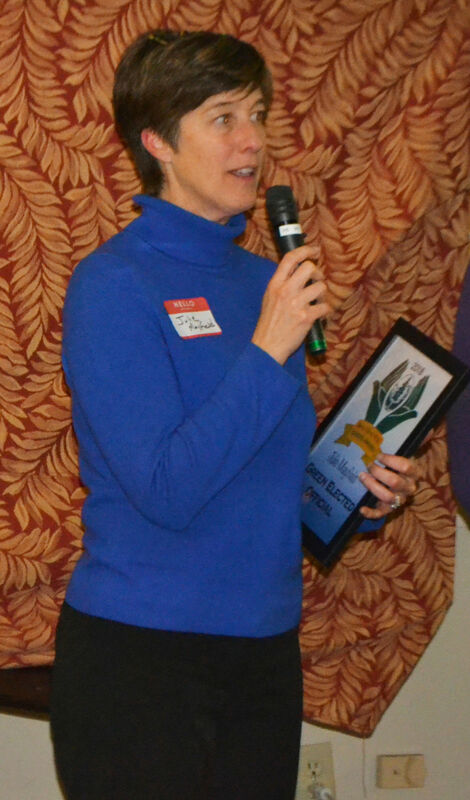 Judy Mattox, executive committee chairman of the WENOCA Sierra Club, received the Political Volunteer of the Year award for her efforts in the November elections. Mattox recruited 238 volunteers and helped raise $70,000 in funds to support pro-environmental candidates seeking office, said Ken Brame, WENOCA Sierra Club political committee chairman, presenting the award to Mattox. “We do election work to make a difference,” Brame said. The vast majority of the candidates that Sierra Club endorsed ran successful campaigns with support from the organization, and 12 seats were picked up in the state legislature, Brame noted. The politically active club also gave awards to Asheville City Councilwoman Julie Mayfield and John Noor, chairman of the Asheville Sustainability Advisory Committee on Energy and the Environment Commission, for successfully advocating that the City of Asheville set a goal of municipal operations transitioning to 100 percent renewable energy by the year 2030. Sierra Club member Joel Mazeli presented another government-related award for sustainability efforts to 1st Sgt. Todd Lingerfelt of the North Carolina National Guard for his unit’s work at field maintenance shop #1. In the past two years, the shop has exceeded expectations in reducing hazardous and other types of waste, as well a reduction in water usage. The shop also has recycled motor oil, batteries and wood pallets, keeping them from landfills, Mazeli said. And outdated lighting fixtures have been replaced with energy-efficient LED lights, he added. ‘They’ve set a precedent in North Carolina,” while also placing second in the 2018 Secretary of Defense environmental awards, Mazeli remarked. Sierra Nevada Brewing Company received the Green Business of the Year award for its innovative environmental practices. The brewery has a storm water management system that collects rain water and repurposes it for irrigation and other non-potable water use, as well as low-flow toilets and faucets. The company also has an estimated 2,200 photovoltaic solar panels and uses technology that converts methane biogas captured at its wastewater treatment plant into electricity. Recycling and composting programs used during construction have enabled the brewery to divert 81 percent of its waste from the landfill. And recovered carbon dioxide is used to make more beer, said Sierra Club member Maryanne Rackoff while presenting the award to Leah Cooper of Sierra Nevada Brewing Company. Energy Savers Network received the Environmental Organization of the Year award for its efforts in mobilizing volunteers to improve the homes of lower income people and helping them with energy efficient measures such as weather stripping, water heater insulation, LED lights, water saving fixtures and minor repairs that save energy. Since 2016, ESN has assisted more than 200 families, including 168 over the past 12 months. Naturalist and educator Carlton Burke was honored as naturalist, educator and wildlife rehabilitator of the year for his organization in Mills River, which presents live animal and nature programs and displays for area schools, summer camps other organizations. Burke is a licensed wildlife rehabilitator who served as the curator of exhibits at the Western North Carolina Nature Center for more than 25 years. He also teaches with the Blue Ridge Naturalist program at the North Carolina Arboretum. The editor-in-chief of Blue Ridge Outdoors magazine, Will Harlan, received the Conservation Advocate of the Year award for his commitment to conservation. This past year Harlan created the I Heart Pisgah initiative to help safeguard wild and biologically important places in the Pisgah and Nantahala national forests. He also founded and organized Friends of Big Ivy, a grassroots organization that protects the old-growth forests and wild areas of the Big Ivy section of Pisgah National Forest. The awards presentations and holiday event took place at the Unitarian Universalist Congregation of Asheville where the Sierra Club of Western North Carolina holds meetings on the first Thursday of the month. For more information, visit the website at www.wenoca.org.